I come from a Catholic country and Holy Week was always a somber occasion. While I never really liked the bunny and eggs connection ( although I see why missionaries thought it necessary to incorporate pagan rituals to make Christianity palatable to their would-be converts), attacking the Easter bunny was uncalled for. I work near this sweets shop and my heart sank when I heard about it. I wanted to shake my fists and yell "punk!" 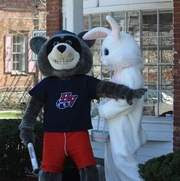 I love how local minor league baseball team Renegades responded: They sent Rascal the mascot to protect the Bunny. I find the idea of a bat-wielding raccoon avenger with a built-in disguise---the black eye mask haha---keeping a close watch on things, hilarious. Copyright 2006| Blogger Templates by GeckoandFly modified and converted to Blogger Beta by Blogcrowds.